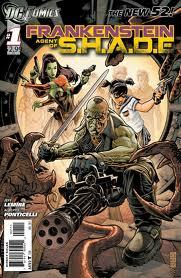 The New 52 kicks weirdness into overdrive with Frankenstein: Agent of S.H.A.D.E. The book is probably best described as a “weird science” comic, as it’s full of monsters and mad scientists, and doesn’t feature much spandex and superheroes. The issue opens strong with a swarm of Mike Mignola-esque giant monsters emerging from a Washington State lake to harass a grandpa and grandson as they fish with their dog Eli. The dog ends up skinned alive, and we can only guess what happens to the people (but we assume it isn’t good). Cut to the Ant Farm, a 3-inch flying sphere currently speeding through the skies over Manhattan. The sphere is the base of S.H.A.D.E. (the Super Human Advanced Defense Executive), a sort of league of mad scientists and horror-themed characters who work with the government. Agents teleport and shrink down to fit within the tiny HQ thanks to the help of scientist Ray Palmer, the “straight man” of the operation (and the man who will, presumably, go on to become the shrinking superhero the Atom). Agent Frankenstein (the creature from Mary Shelley’s novel with visual inspiration courtesy of Universal Studios) enters the Ant Farm and demands to speak to Father Time, presumably S.H.A.D.E.’s leader. There was a previous cut-short Frankenstein series featuring many of the same characters prior to the reboot, and I presume Father Time figured in that as his traditional old bearded guy routine. Here we find the father after he has assumed a new form, that of a preteen Asian schoolgirl armed with a pistol and wearing a domino mask. This unnerves Frankenstein, but I thought it was fun, and it definitely ramped up the weirdness on what was already shaping up to be one of the strangest offerings of the New 52. Father Time explains the problem with the monsters marauding through a rural Washington town, and says that they already have a S.H.A.D.E. agent in the field, Frank’s wife (essentially the Bride of Frankenstein, but without the shock hair and with an extra set of cadaver arms for wielding extra guns). Mrs. Frankenstein has broken radio contact and cannot be found, so it’s up to Frank and his new field team to find her, save as many civilians as possible, and take care of the monster infestation in 6 hours, or the government will drop nukes on the place to contain the situation. Frank’s field team includes a new take on the Creature Commandos. We’ve got Dr. Nina Nazursky, a self-created amphibian/human “Creature from the Black Lagoon” science genius. We’ve got Warren Griffith, who subjected himself to lupine blood to become a werewolf, and Vincent Velcoro, a former S.H.A.D.E. pilot who transformed himself into a winged vampire hybrid. And last we have Khalis, a mummy with healing powers who is very likely a real mummy from Ancient Egypt. Albert Ponticelli’s somewhat rough pencils and chunky inks, coupled with Jose Villarrubia’s subdued earthtones and drab greens, lend a sense of darkness and, dare I say it, realism to the comic that I found very appealing and a great match for the subject matter. Ponticelli’s linework reminds me of Kevin O’Neill mixed with Mark Mignola, and from discussions with friends and at the comic shop, it appears I may be in the minority in liking it. Pretty much everyone I’ve talked to about the issue said they liked the story, but “couldn’t get into the art.” Different strokes, I guess, but I much prefer this sort of style to a lot of other stuff on the shelves. Jeff Lemire’s script isn’t as ambitious as his Week 1 offering in Animal Man #1, and relies overmuch on an exposition-spewing computer voice in captions. None the less, I rather enjoyed it because all of the exposition was at least interesting, the sort of mad ideas I really appreciate in a comic book. Lemire has developed a compelling voice for the lead character. This Frankenstein is wary of mad scientists and their golem-like creations, fond of classical literature, and confident in the face of overwhelming odds. I found him charming. When I heard DC was rebooting their universe, the thing that excited me most was the idea that all 52 titles would be given a chance to rise or fall on their own merits. Accordingly, and perhaps as an attempt to diversify their audience, DC brought back some classic non-superhero genres to compete with the four-color heroes. These are the titles I’ve been looking forward to most, and Frankenstein: Agent of S.H.A.D.E. delivers. Will it find and keep an audience that will sustain it in print? After seeing too many inventive comics like this shrivel up and die over the years (I’m looking at you, Agents of Atlas), I’m skeptical. But I’m definitely on board, and I hope to enjoy the ride for a long time to come.